The Basic Laws and the order of Putting on the Tefillin. A Jewish boy, upon reaching his thirteenth birthday, is regarded as a full fledged Jew. He then becomes a "Bar Mitzvah," meaning that he is begins to keep and perform all the laws and customs of the Jewish people. One of them is is Tefillin. It is customary to initiate the boy into the practice of donning the Tefillin two or three months before the actual date of his Bar Mitzvah. When purchasing a pair of Tefillin, care should be taken to buy it from a dependable store in order to be sure the Tefillin are hand-written by a duly qualified Scribe (sofer). Those not produced in conformity with the specified requirements of Tefillin, may not be used. Tefillin are worn during the morning prayers. However, if for some reason it was impossible to do so in the morning, Tefillin may still be put on later in the day, but not after sunset (for your local times see Halachic Times - Zmanim). The person should be standing. He takes out the "Hand" Tefillin first, and places it upon the biceps of the left arm, adjusted so as to rest against the heart. Care should be taken that the leather loop through which the strap is drawn is above the box. Before tightening the strap he recites the blessing Lehaniach Tefillin (see Blessings For Tefillin). Then he fastens the strap, winding two coils over the leather extension of the Hand Tefillin and his arm (this forms the letter ש) proceeding to make seven coils on his forearm. The rest of the strap he winds around his palm. Immediately afterwards he takes out the "Head" Tefillin and places it on his head so that the box rests above the forehead, and the knot rests just above the neck. Care should be taken to ensure that the box of the Head-Tefillin is placed properly above the forehead so that the lower edge of the box should not fall below the hair roots, and that it is centered at a point midway between the eyes. Having so adjusted the Head Tefillin, he now unwinds the strap from his palm in order to make three coils on the middle finger, the first on the lower phalanx (near the palm), the second on the middle phalanx, and third, back again on the lower phalanx. The remainder of the strap is then wound around the palm. In some communities it is customary to make the blessing al Mitzvat Tefillin over the Head-Tefillin before adjusting it, followed by Baruch Shem Kevod Malchuto Le'Olam Va'ed. There are also slight variations in the manner of winding the straps around the arm, palm and middle finger. For illustrations and video instructions see the Putting on Tefillin Guide. The Tefillin should be placed upon the bare arm and head, without anything intervening. During the putting on of the Tefillin one should not interrupt the procedure by conversation or gesture. The only interruption permitted is to answer Amen when hearing someone else making the blessing over Tefillin. If an interruption was made, the blessing Al Mitzvat Tefillin should be recited when putting on the Head Tefillin. (In those congregations where this blessing is said in any case, it is also necessary to repeat the first one Lehaniach Tefillin). The straps, both of the Hand and Head Tefillin should always be placed black side up. First the strap around the middle finger is unwound and is rewound around the palm. 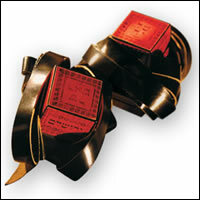 The Head-Tefillin is then removed from the head with the left hand, the straps rewound, and placed in the Tefillin bag. Then the Hand-Tefillin is removed, the straps rewound and placed into the bag. It is customary to put the Head-Tefillin on the right side and the Hand-Tefillin on the left side in the bag. A person who is left-handed (whether one is deemed left-handed in this case should be ascertained from an orthodox Rabbi) puts on the Hand-Tefillin on his right arm. If for some reason it is impossible to put the Hand Tefillin on, the Head-Tefillin must be put on nevertheless, and vice versa. In each case the respective blessing is recited. It is required that the person be constantly and respectfully aware of the Tefillin while he is wearing them. It is customary to remove the Tefillin only after the conclusion of the entire morning service. At any rate they must not be removed until after the prayer U'Vah Le'Tzion. On Rosh Chodesh, the Tefillin are taken off before musaph. (On chol hamoed, if Tefillin are donned, remove them before Hallel). When a Talit is worn during the prayer, the Talit should be put on first and then the Tefillin; but when the prayer is concluded, the Tefillin are removed first, in the manner described above, and then the Talit. On Tisha b'Av the Tefillin are not put on for the morning prayer, but for the afternoon prayer. The Tefillin should be handled with due reverence. Should the Tefillin accidentally fall to the floor, atonement is required by fasting or giving charity. In such a case a Rabbi should be consulted as to how the atonement should be made. Said our Sages: He who carefully observes the commandment of Tefillin daily, merits long life and the World to Come. Kehot Publication Society and Merkos Publications, the publishing divisions of the Lubavitch movement, have brought Torah education to nearly every Jewish community in the world, and are the world's largest publisher of Jewish literature. New ones How long do we need to buy new Tallit and Tefilin? I mean, my Tefilin and Talit are still the ones of my Bar Mitzva (20+ years ago). I pray with them everyday. Do I need to buy new ones or can I still use them? A few comments Nice article! The primary custom is to begin putting on tefillin 1 month before bar mitzvah. There are other customs that include 2-3 months as mentioned, and yet some that do not put on tefillin until the day of becoming bar mitzvah/13. It is worthwhile to mention that the Sephardic custom is to sit when putting on and removing the shel yad (tefillin that is placed on the arm). Can I put Tefillin on even if I don't have time to attend a synagogue for Shacharit? Is it ok to put them on @ home? If I know beforehand I won't have time to say the whole service, should I still put them on? Tefillin On what specific holidays or festivals Tefillin are not to be put on? Where I can get this information? Responses To L: Things seem difficult only at the beginning of the road, but once you get the hang of it, it's smooth and enjoyable. However, we are human after all, and we're prone to dull and uninspired days. If you ever feel like your Tefillin-laying needs a boost, head on to our Tefillin Readings section for some inspiration. Every Day? Wouldn't a person get tired of doing this everyday? Tefilin Allthough I am a Liberal Jew, two Rabbi-students on the street in Prague (CZ) toght me how to put Tefilin. Now I have Tefilin of my own.